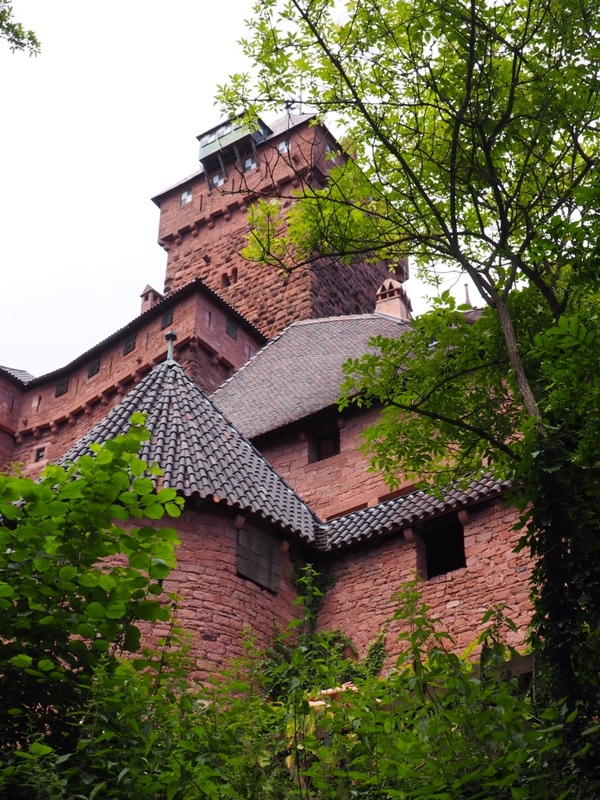 The Château du Haut-Krœnigsbourg would have slipped under our radar if not for two friendly American college students we met at dinner the other night. 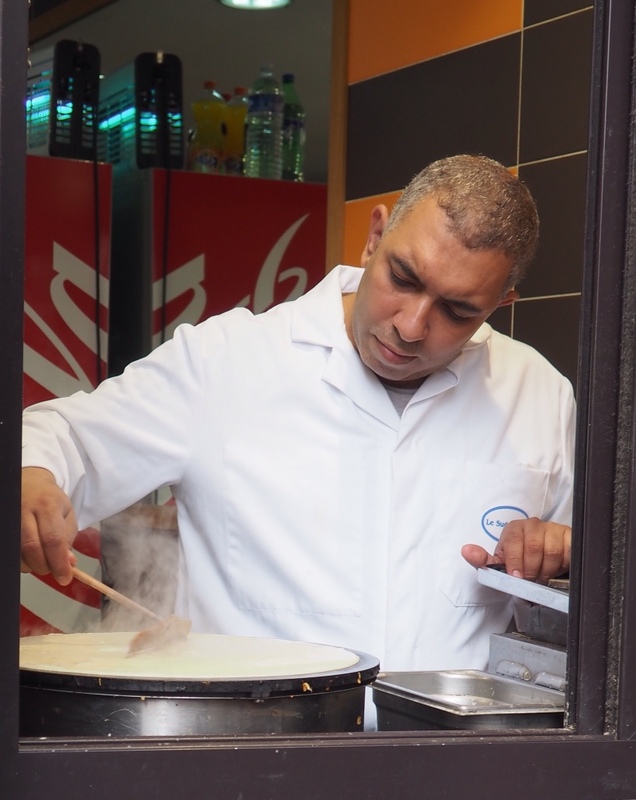 Sitting shoulder to shoulder, as is the custom at French sidewalk cafes, we struck up a conversation with the young men and were soon exchanging stories and travel tips. 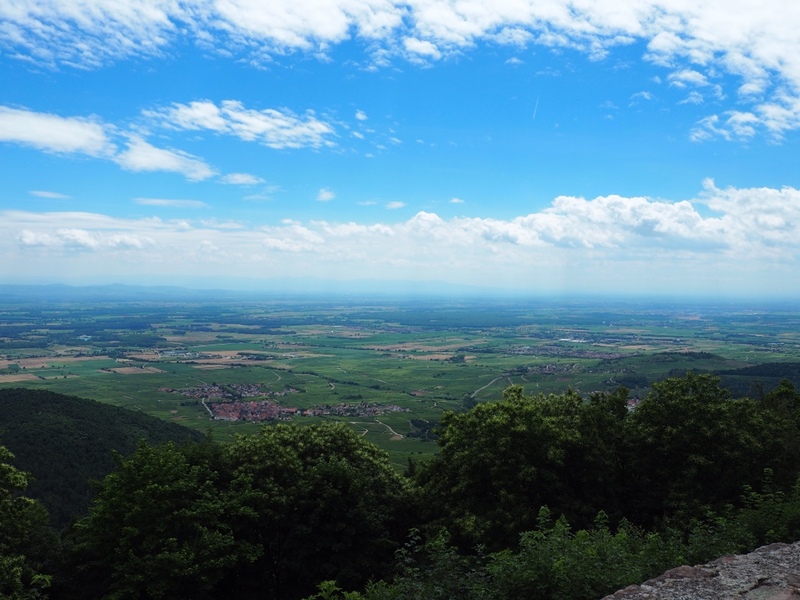 They assured us a visit to the château was a relatively inexpensive day of entertainment with never ending views of the Rhine Valley. 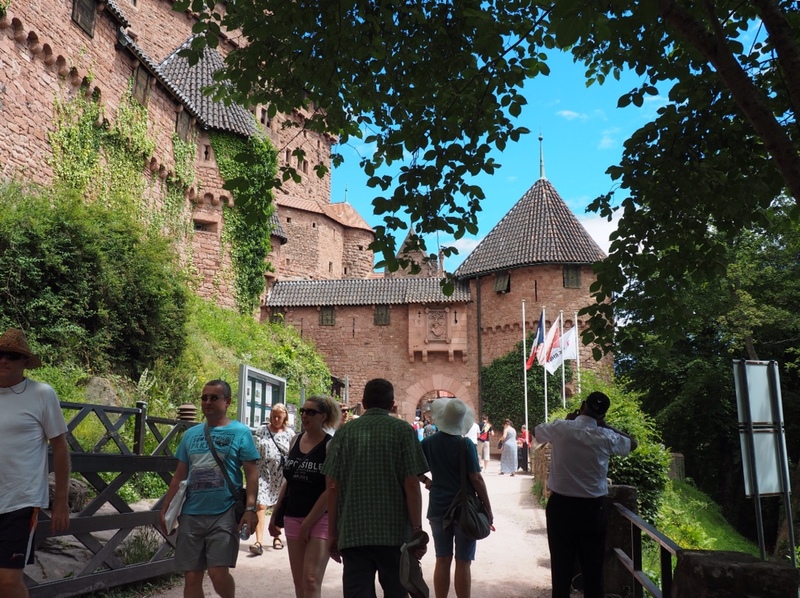 Although the grounds appear crowded, we had no trouble touring the château at a leisurely pace. 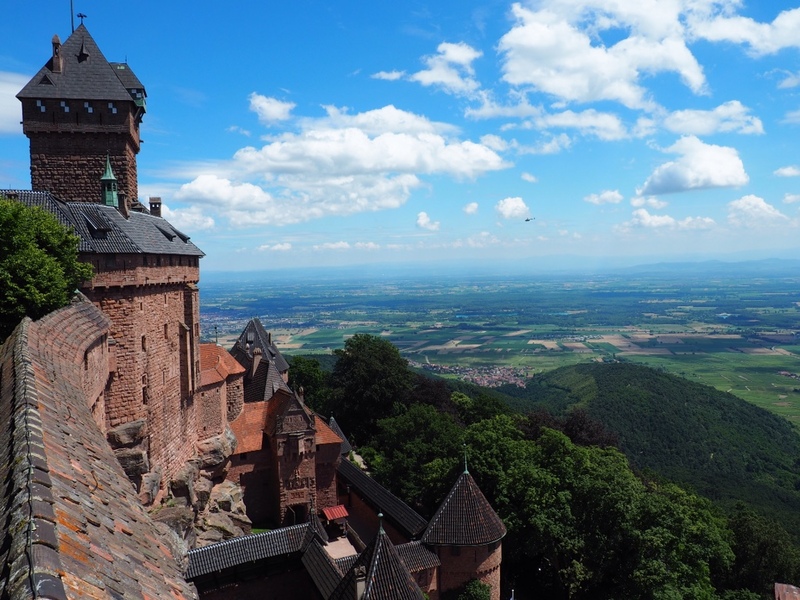 Just a short train and bus ride from Strasbourg, our home base, the château is located on a mountaintop 2500 feet above the Rhine plain. Construction began in 1147 and the design was originally intended to protect the junction of two important trading routes, the wheat and wine route (from north to south) and the salt and silver route (from west to east). After suffering a turbulent history, the château was eventually destroyed in the 17th century, sitting in ruins until the early 1900s when renovations began. Expansive views reward our climb to the artillery platform. The view goes on forever! Thick slabs of mozzarella cheese, sliced tomatoes, lettuce and a basil dressing all sandwiched in a baguette! We couldn't have asked for a more scenic lunch spot! A view of the Rhine River from a pedestrian bridge connecting France and Germany, with a Viking cruise ship docked next to the German bank. We head for a suspension bridge, our path to Germany. 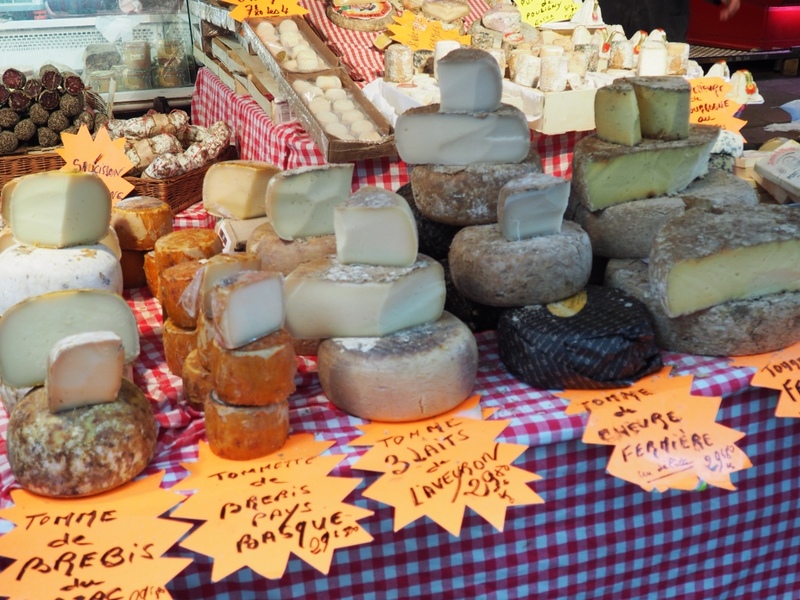 If you are a traveler, there is a lot to like about the European Union. 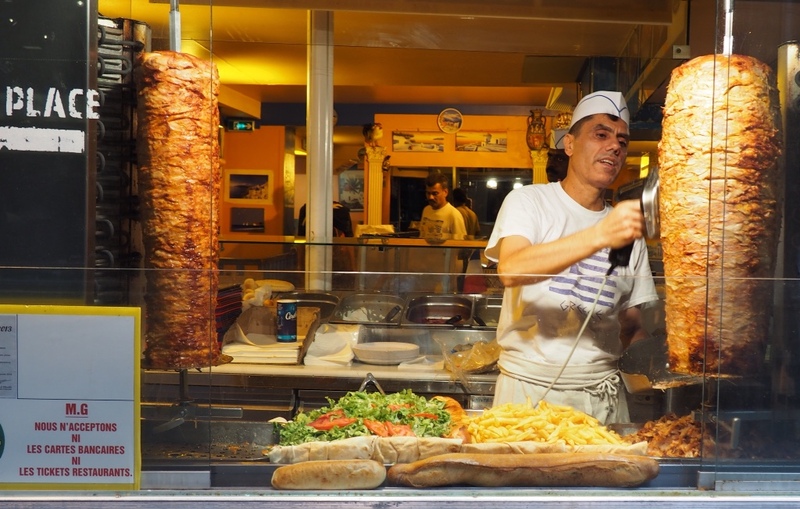 The euro makes managing currency so easy as you go from country to country. Then there is the seamless movement across borders. So, today, we walked to Germany. 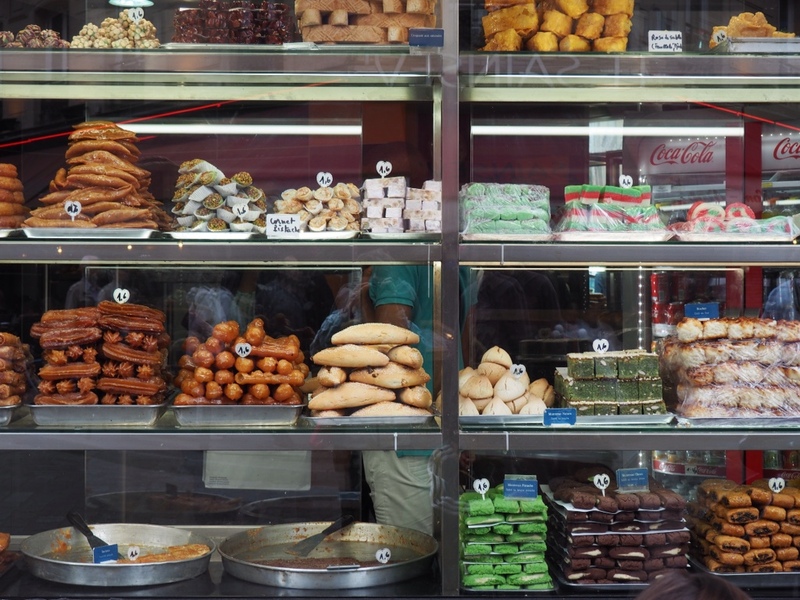 No passport necessary. Easier than going from Oregon to California (no stopping at the border to confirm you don't have fruit). 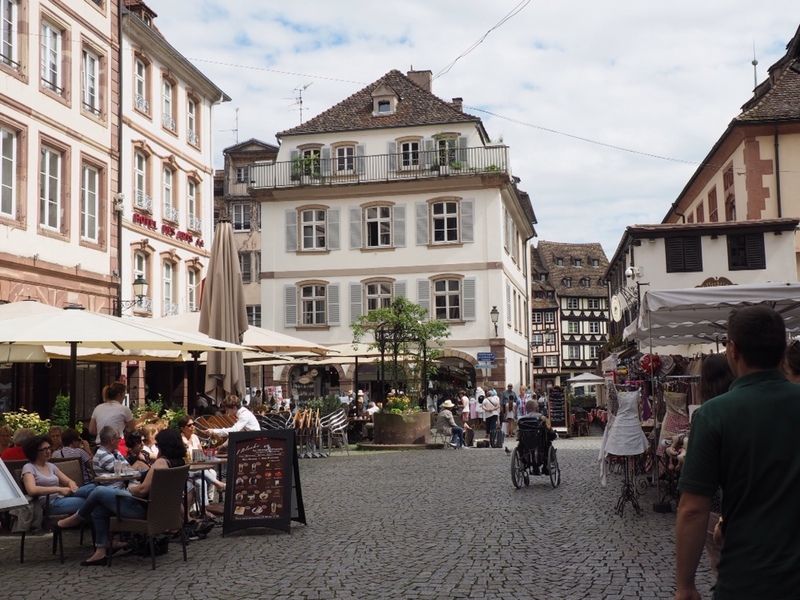 We are staying in Strasbourg, part of the Alsace region of France tucked against the Rhine River, the border with Germany. 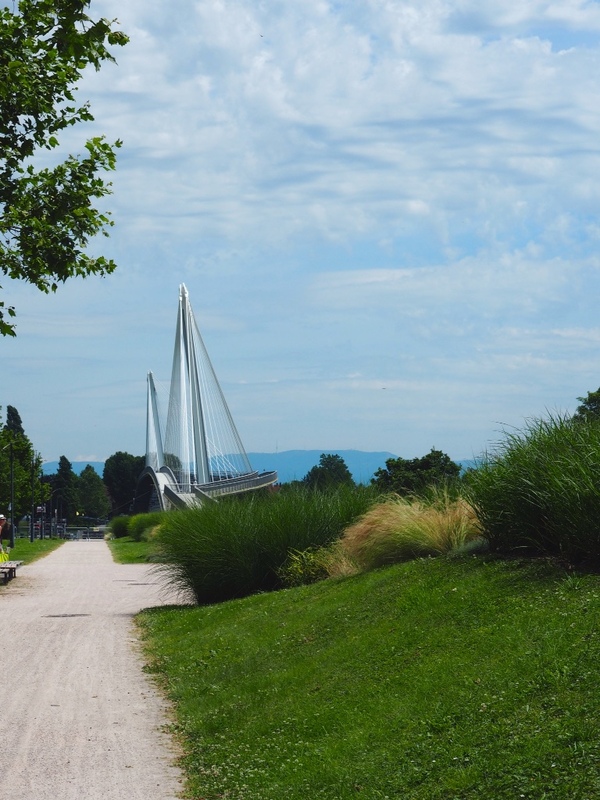 We took a city electric tram to the end of the line, then walked about a mile to Jardin des Deux Rives, the Garden of Two Banks, where we found a spectacular suspension bridge for pedestrians and bicyclists. It led to the other bank, in Germany. 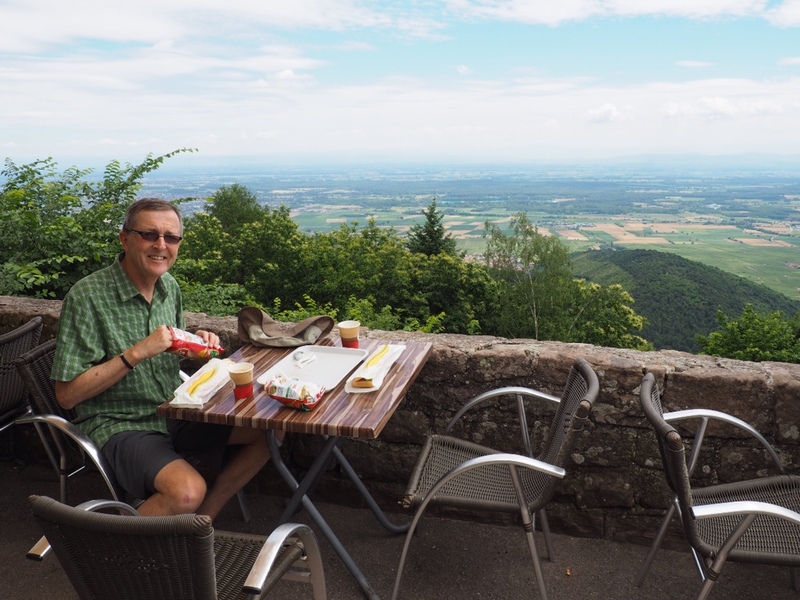 After climbing a viewing tower for a distant look at the Black Forest, we had a relaxing riverside picnic before heading back to our home in France. 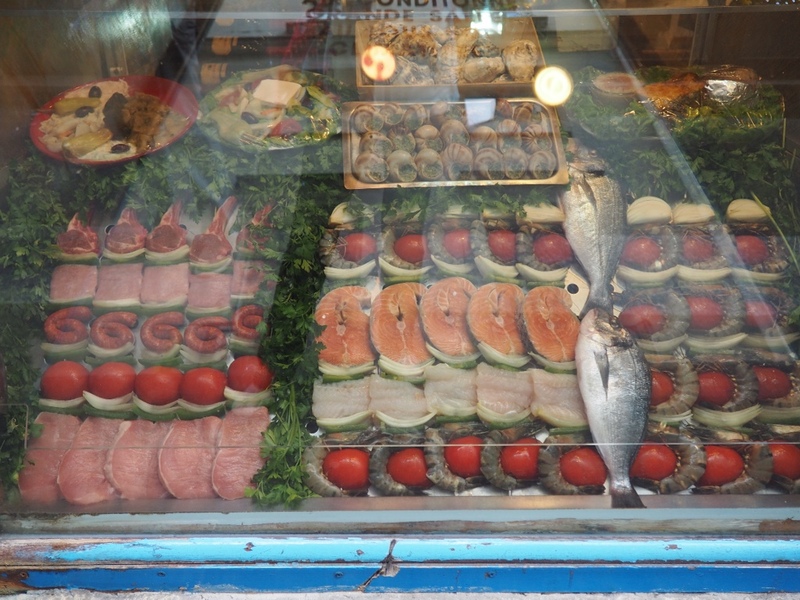 What's not to like about Europe! Two hundred steps to views of two nations. 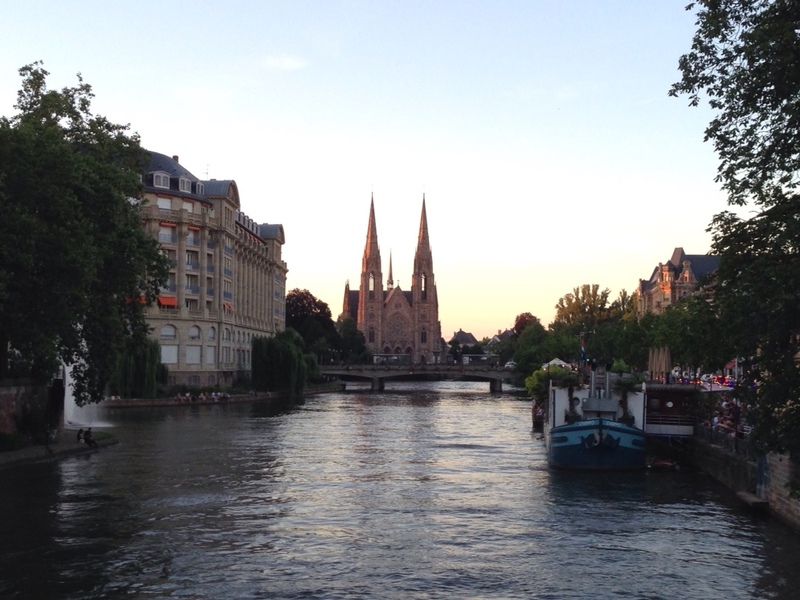 Look closely to the left for the Strasbourg Cathedral spire. 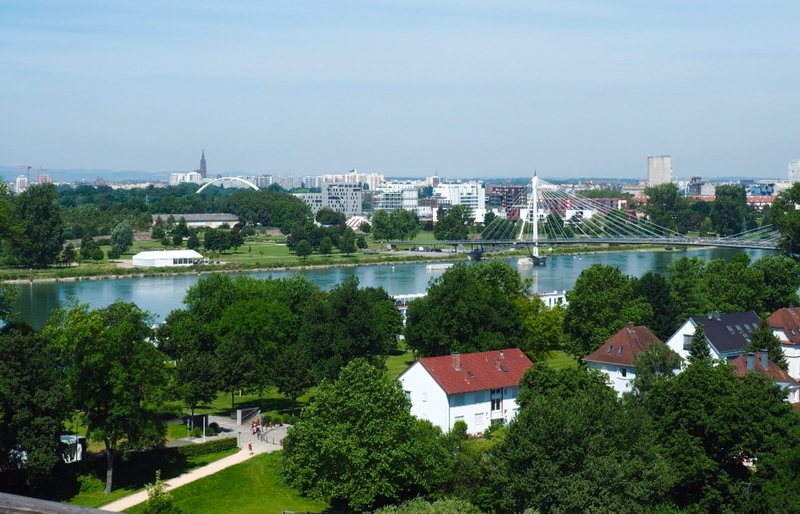 The Rhine and the pedestrian suspension bridge are in the foreground. 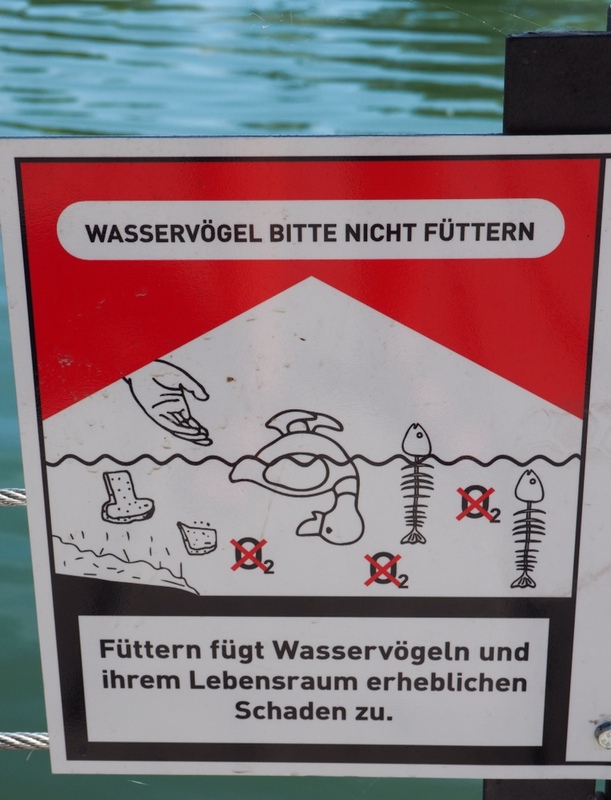 Looking out for wildlife in Germany. 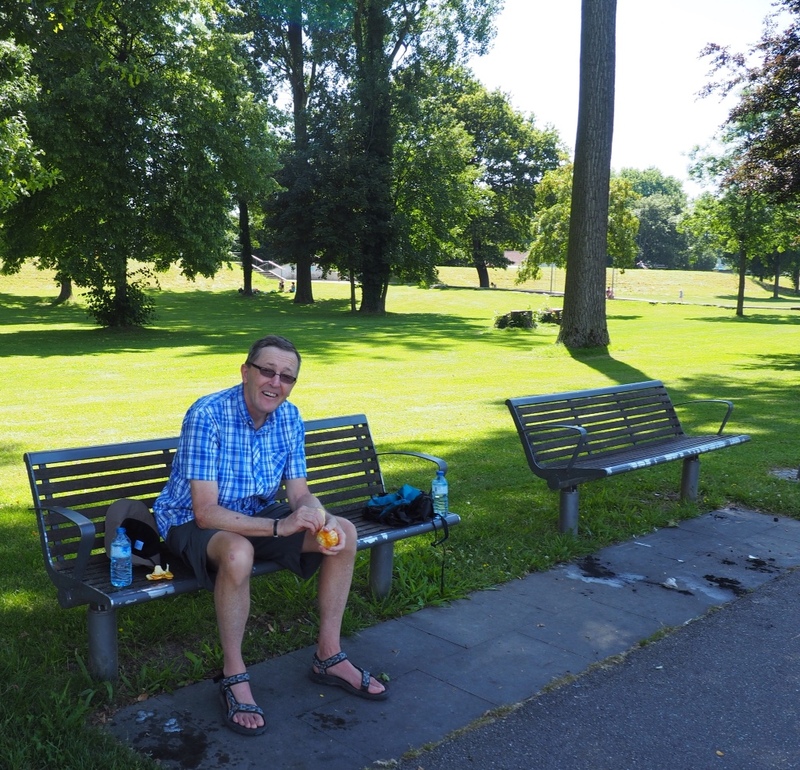 I have to admit, it was fun to have a picnic in Germany. This enthusiastic Frenchman's spirit was contagious. 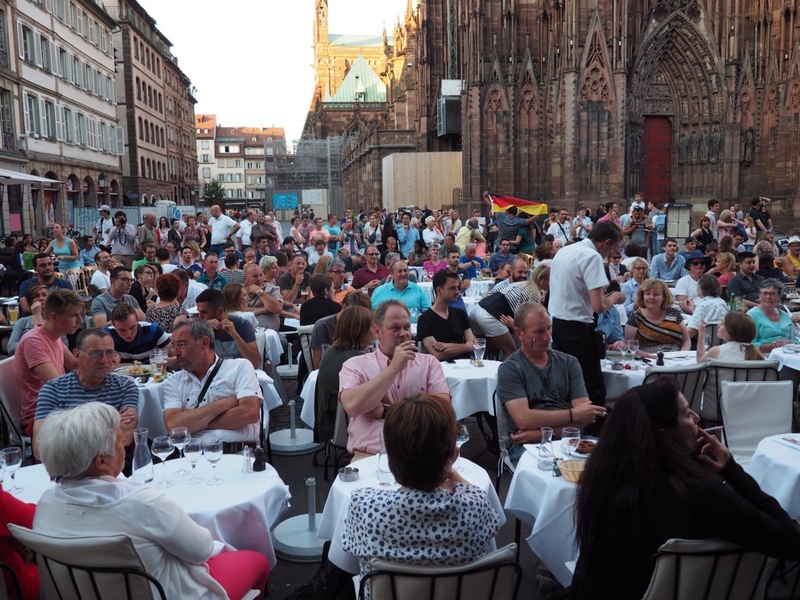 The France vs. Germany semi-final Euro Cup match was cause for celebration in Strasbourg tonight. Crowds gathered early, grabbing good seats in the few cafes with outdoor TV screens. We were lucky enough to find a good seat, a great meal and entertaining company for an evening of good natured cheers and jeers. 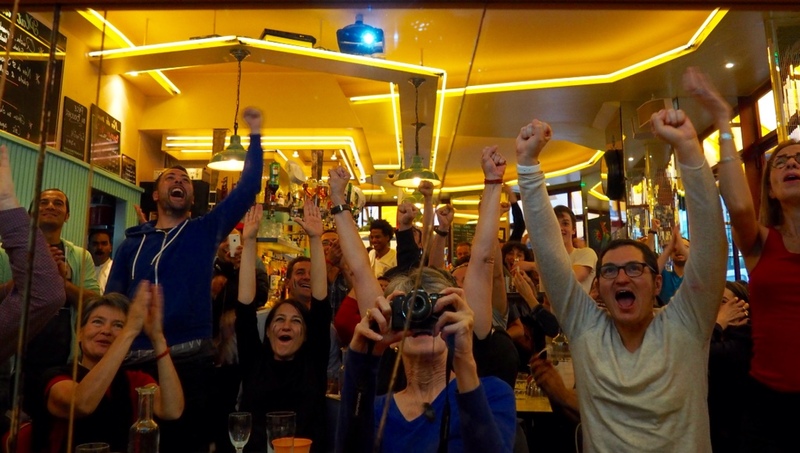 A France victory made for a happy ending…at least for most of the crowd. It was standing room only in the square around the cathedral. A busy night for the servers at this cafe. If you look closely, you can spot me in my pink tee shirt, sitting near the back. 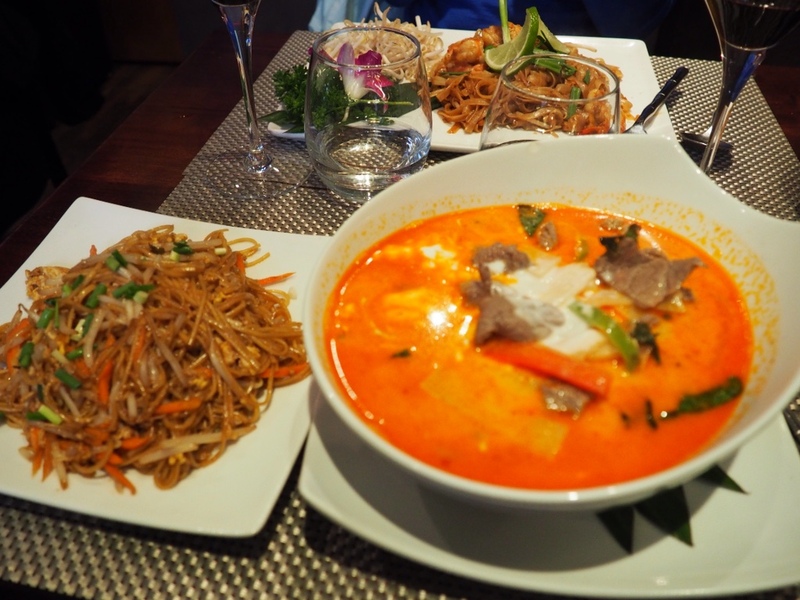 Dinner was surprisingly good for a cafe in such a busy tourist area. 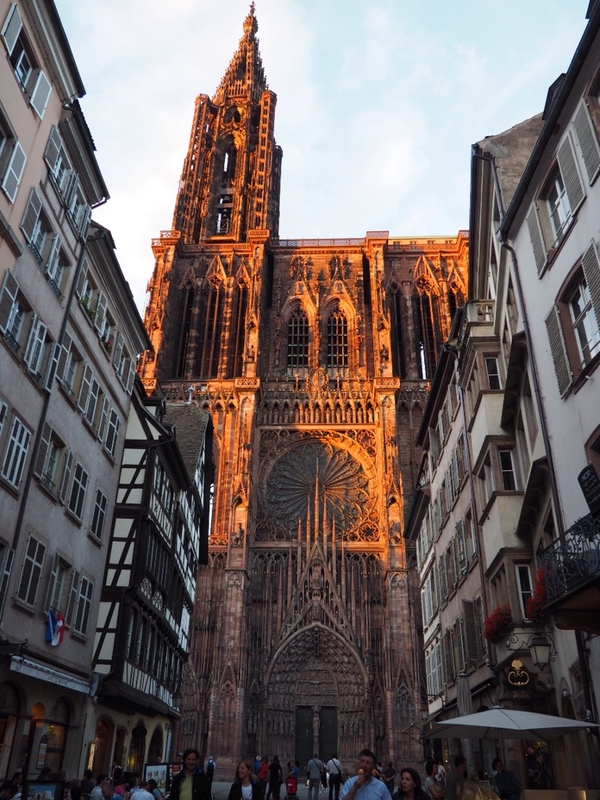 The setting sun lights up Strasbourg Cathedral. 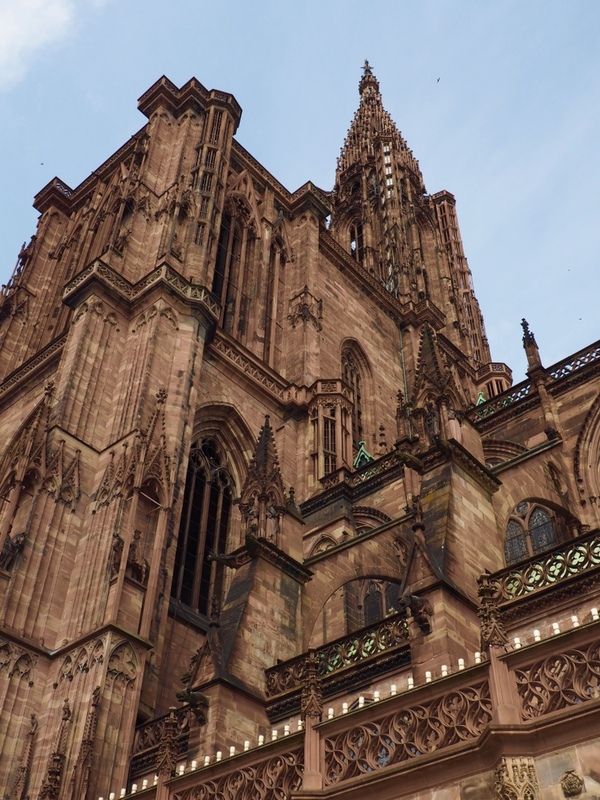 For nearly 600 years Strasbourg Cathedral has soared 466 feet above the cobbled streets of the city – an unmistakable landmark for the surrounding countryside. Work began on this Gothic wonder in the year 1176 and continued until the cathedral's completion in 1429. It's hard to imagine the manpower needed (and sacrificed) during construction years. Visitors are welcome to wander through the cathedral daily, at no charge, during specified hours. While we found the clock interesting, the presentation was a bit long-winded. 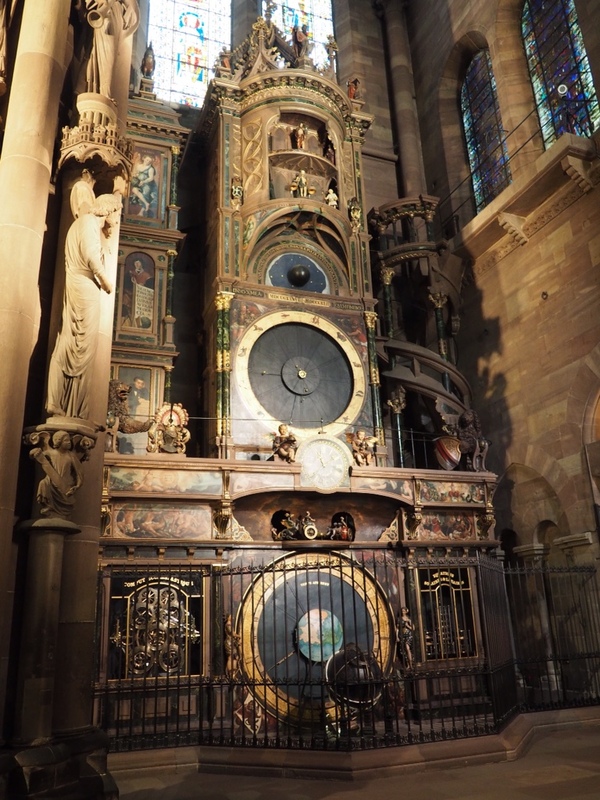 Don't miss the 15th century astronomical clock, a high-tech marvel for its time. The clock was restored in 1883 and for a small fee visitors can enjoy a special noontime presentation of the clock and its features. Somewhere out there is our apartment. 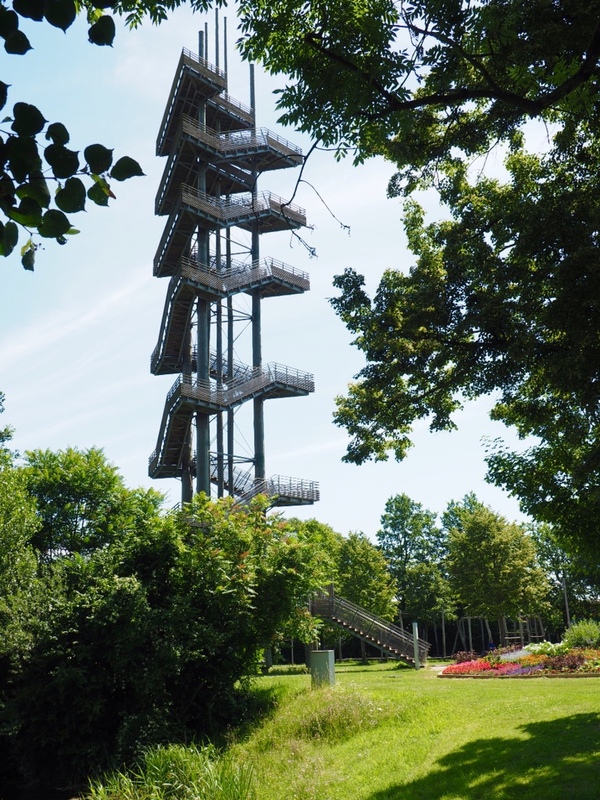 The high point for us (literally) was the 332-step circular staircase climb to the top of the narthex, a viewing platform with 360 degree views, extending for miles. There is a small charge for what amounts to quite an endurance test, but the rewards are well worth the physical investment. 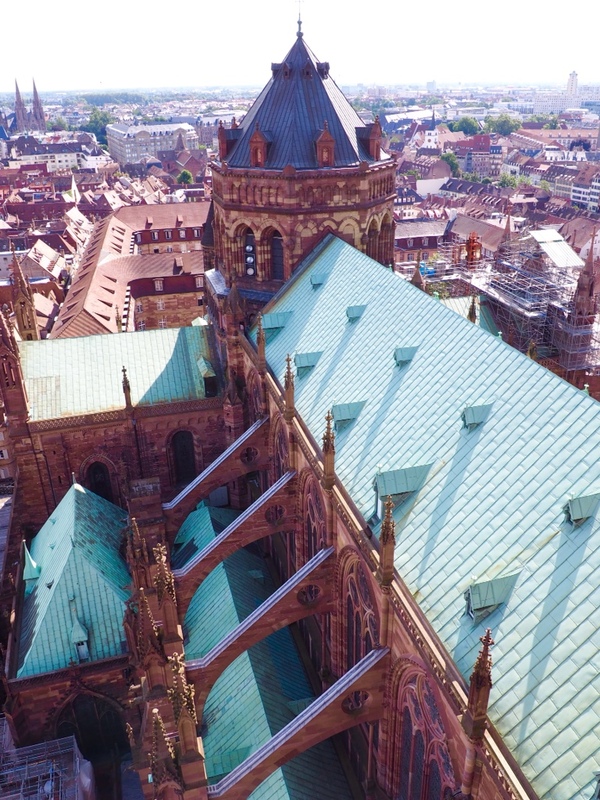 This view shows the viewing platform just below the spire. One lucky group was climbing up the spire...we would have followed them, but the gate was locked. Obviously, we don't know the right people! 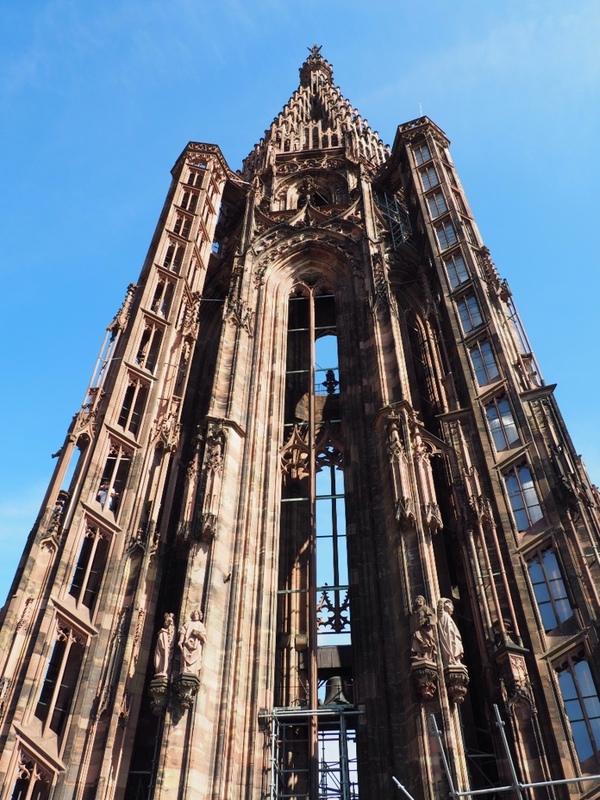 The walk back down provided yet another view of Strasbourg Cathedral. This spot next to a canal is on our list for a happy hour some evening. Flowers compete with food for your sensory attention. 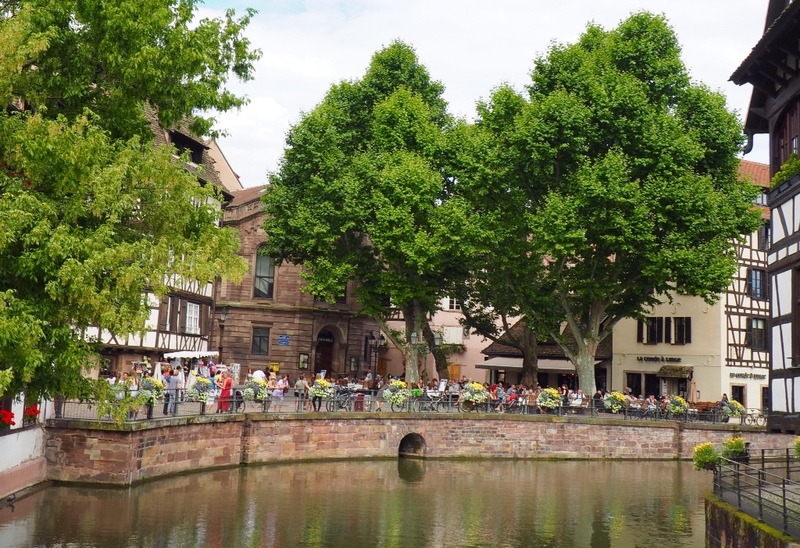 Strasbourg, France greeted us Monday as we arrived via fast train from Paris. A city of about 370,000, it has been under French and German rule, including four years of Nazi occupation, 1940-1944. 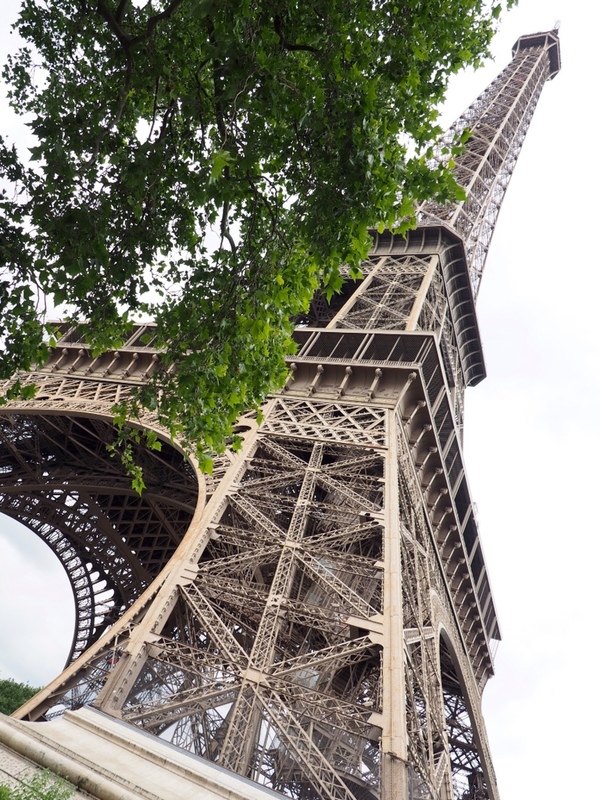 It has France's second-highest university student population and, after two days of exploring, we conclude that it must be one of Europe's premier tourist destinations. Many come on Rhine River cruise tours. It is also home to the European Union Parliament. 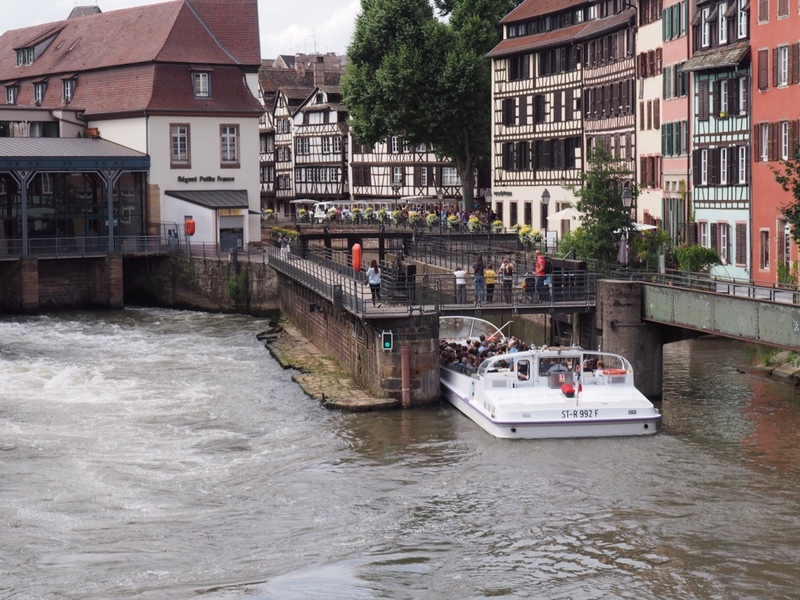 We resisted the mini-train with an audio guide in eight languages, but got a Strasbourg pass for 19€ that includes a canal boat tour. The old central city, a World Heritage site, has a bit of a Venice, Italy feel. 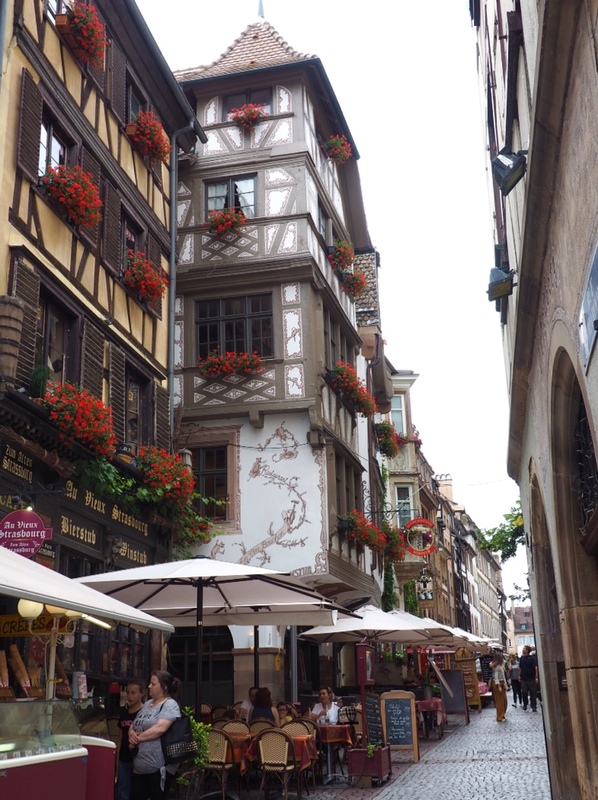 Narrow, winding alleys and streets. 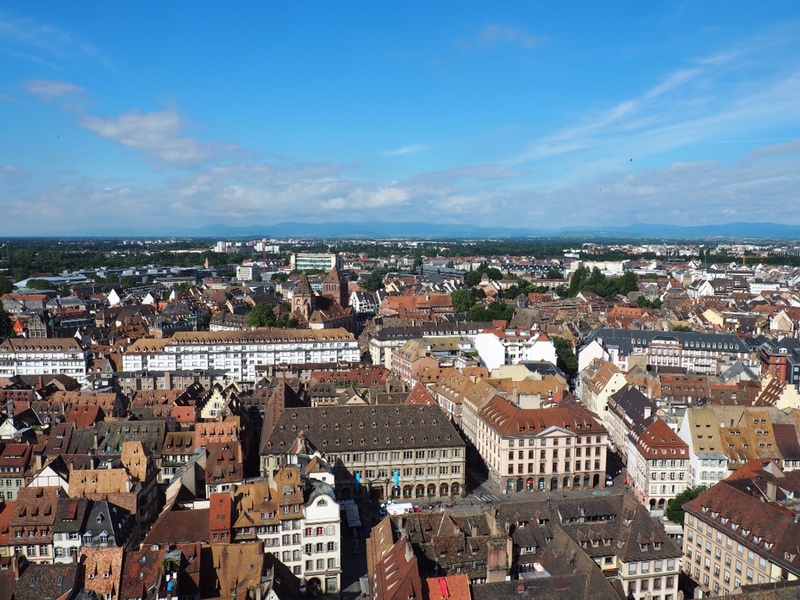 It is a walkable city, but if your feet get tired, there is a modern electric tram system that crisscrosses Strasbourg and is popular among locals and tourists. 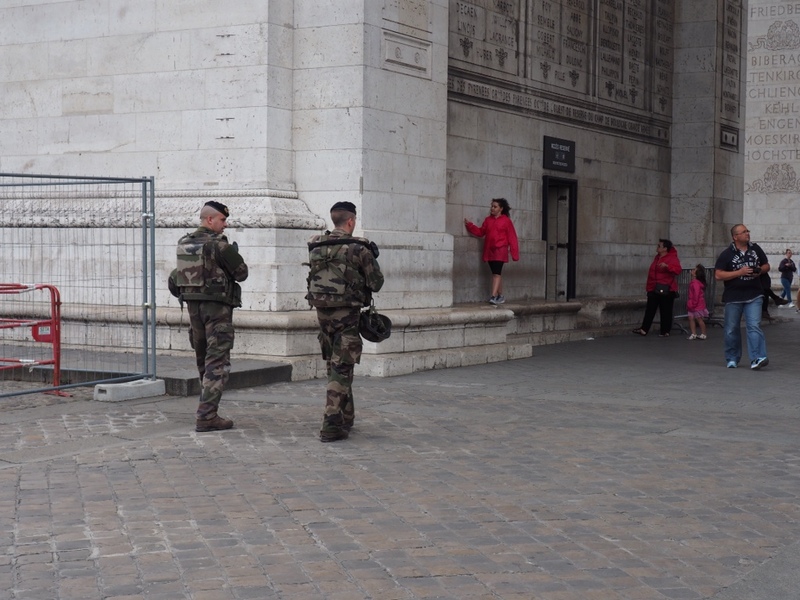 It took us a while to figure out the ticketing system, but once we did, other tourists sought us out for help. Be sure to get your ticket validated in the machines at all stops. Tour boats go through locks as they negotiate the canals. 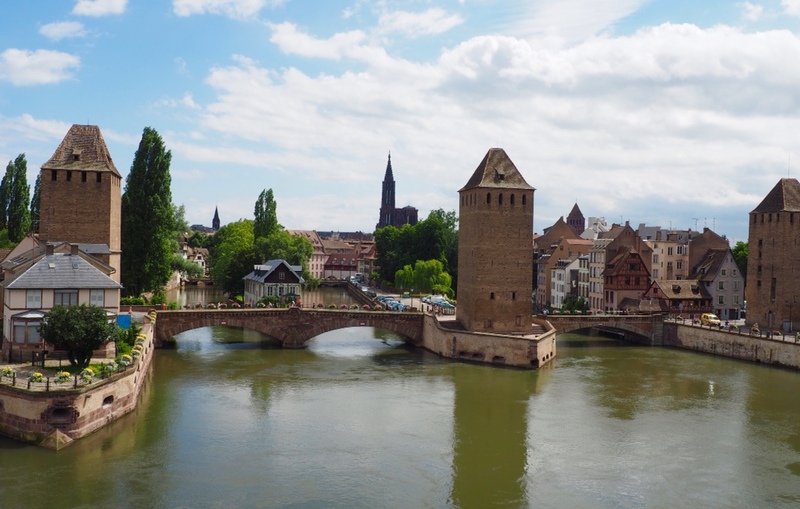 Towers once linked covered bridges in the Petite-France neighborhood in Strasbourg. Cobblestone streets are free of traffic most of the day in the central city. 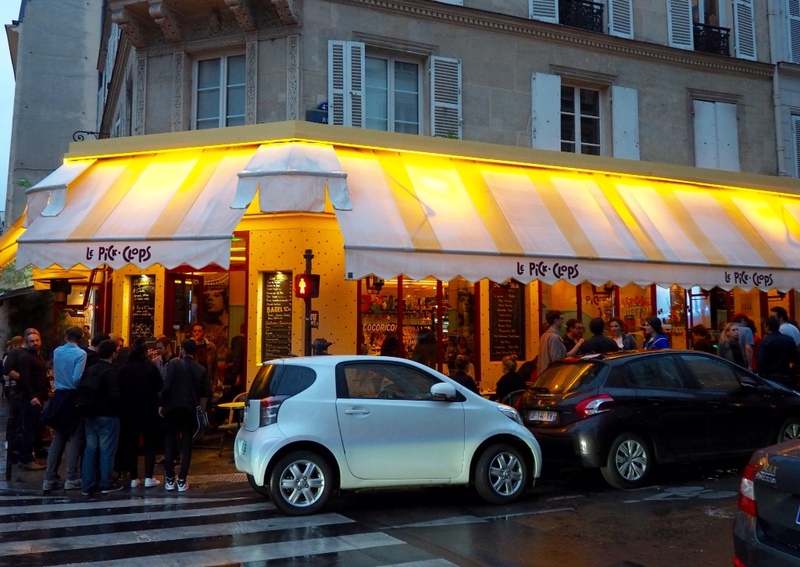 When we grabbed a dinner table at this casual Paris cafe we had no idea we would soon be hooting and hollering with the local football fans. Their energy was hard to resist. 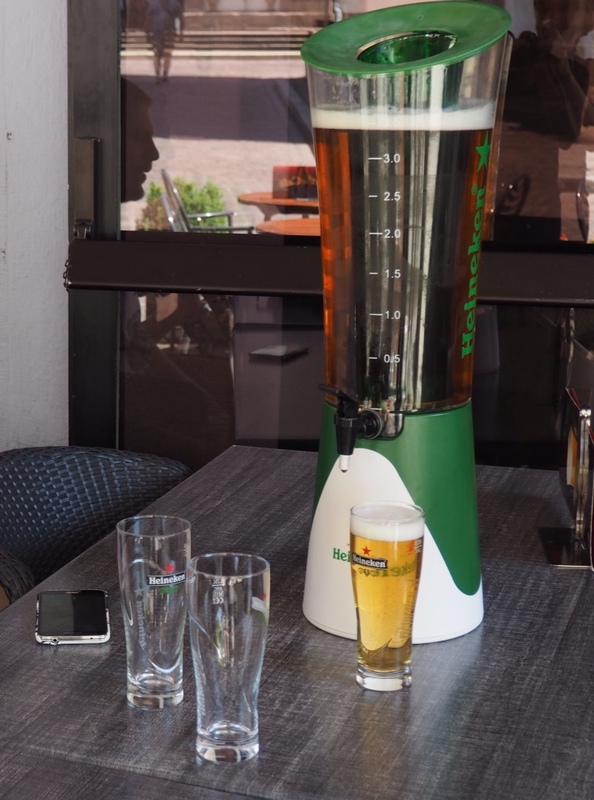 Little did we know when we planned our France trip that the Euro Cup would be in full swing during our stay. Even more exciting was Iceland's fairytale rise to the quarter finals where they met their match against France…a match that played out tonight. We couldn't figure out what this cafe name meant, but we made the right choice for a fun-filled evening! As game time approached and the big screen came down, we found ourselves with front row seats to the upcoming France v Iceland match. 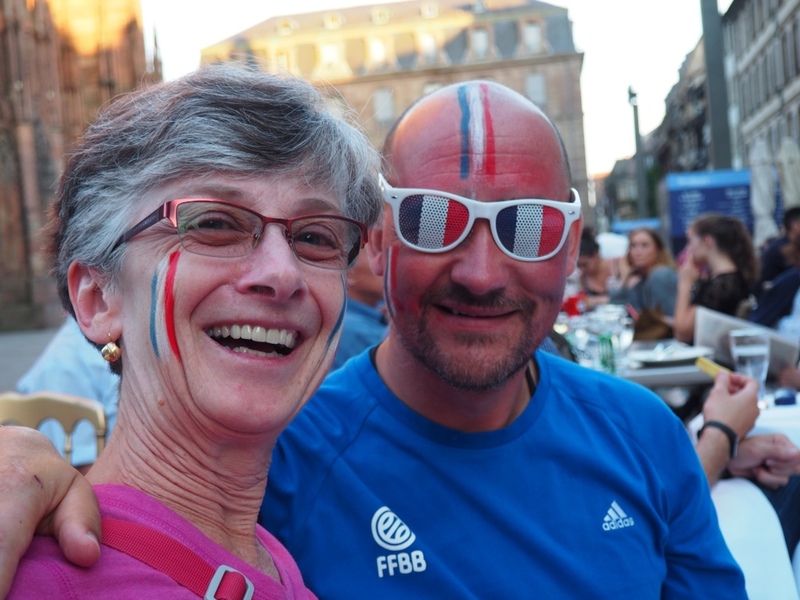 As more and more fans crowded the bar we became trapped among some of France's most rabid supporters. The crowd went wild when France score a second goal. As you can see, the rowdy crowd was thick behind us. What else could we do but order another glass of wine and cheer for the home team? It was Sunday, a bit chilly and overcast in Paris. Not a bad day for a walkabout. Our neighborhood bakery was closed, so we had to settle for a breakfast baguette from a grocery store, with the usual butter and jam. 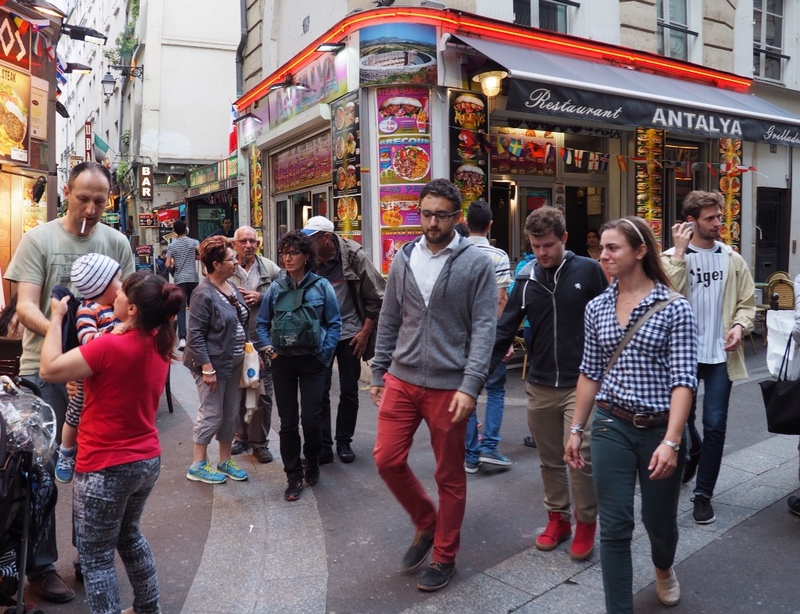 We packed a few picnic items and were off, walking first along the Seine several miles to the Eiffel Tower. Zigzagging through neighborhoods, we found Luxembourg Garden, 60 acres filled with virtually everything a park should have. It oozed relaxation and many parts of the park looked like an impressionist painting brought to life. Lots of people about, children playing in the huge playground, men playing bocce ball, teenagers being kids, and people of all ages sitting as time passed. 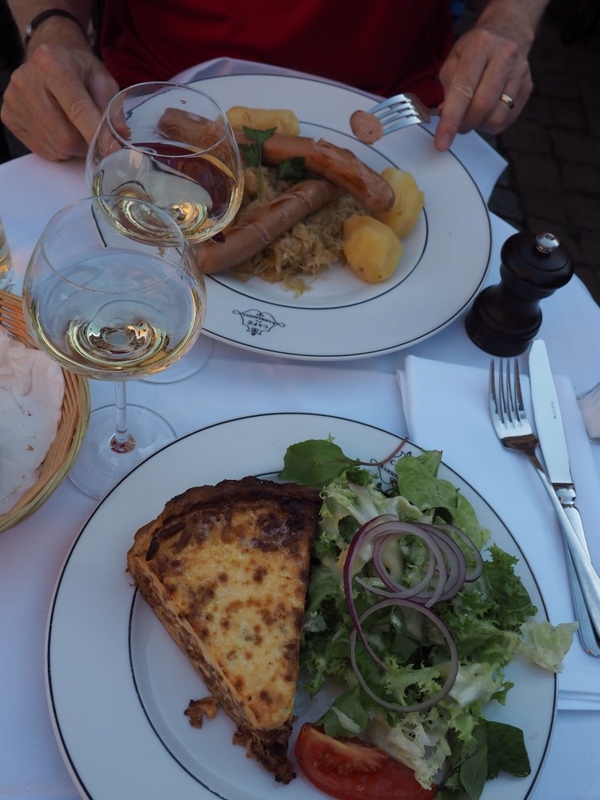 The garden was quintessentially French, a place where life seems unhurried. 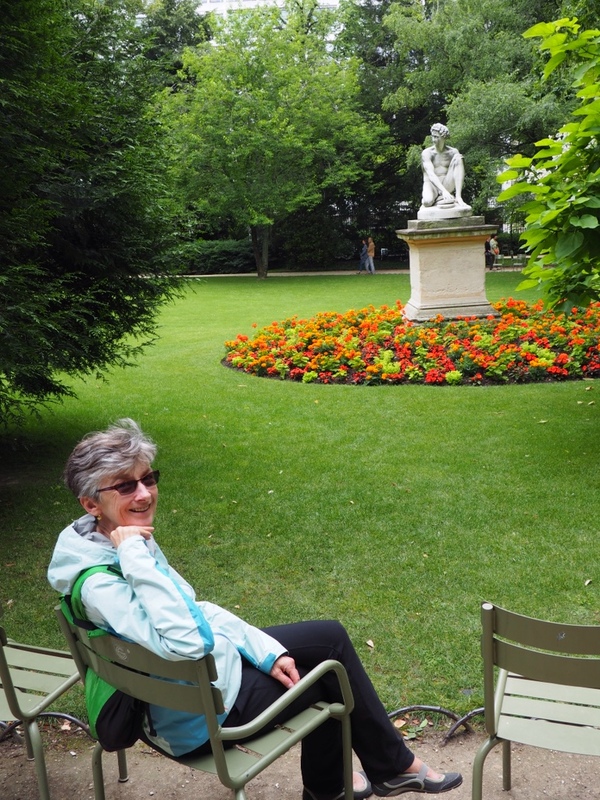 Sue enjoys one of the many small area and sculptures in Luxembourg Garden. 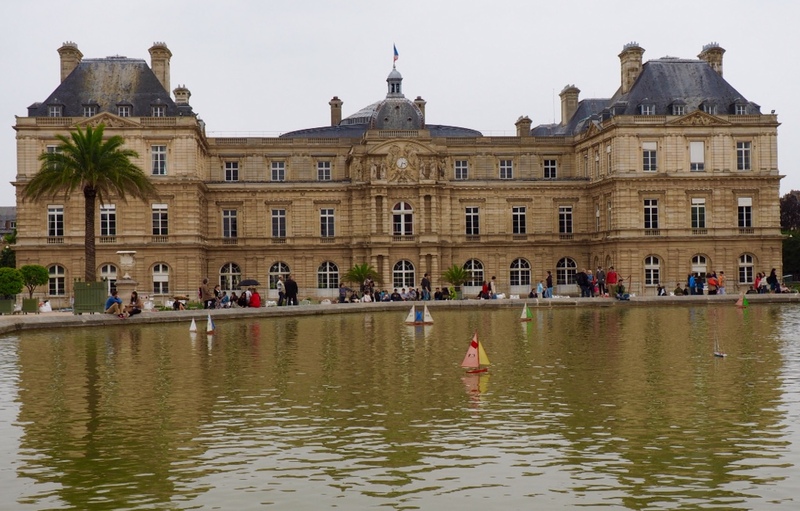 Remote-controlled sailboats in front of Luxembourg Palace at the park. 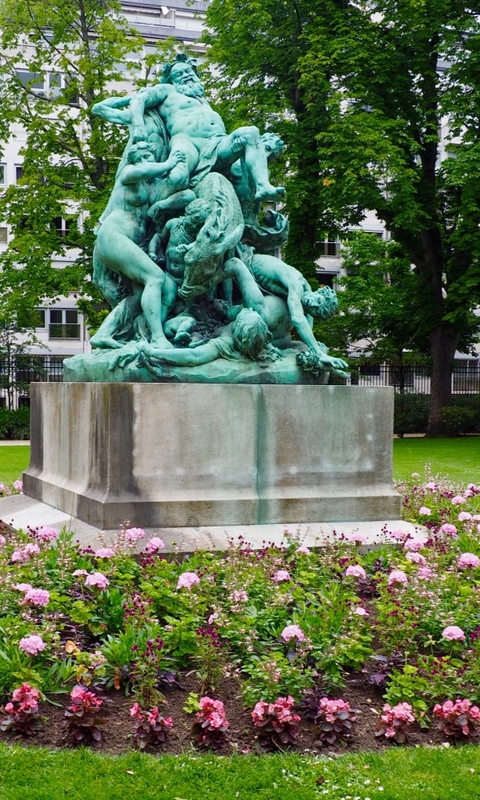 A group wrestling match is frozen in time at Luxembourg Garden. 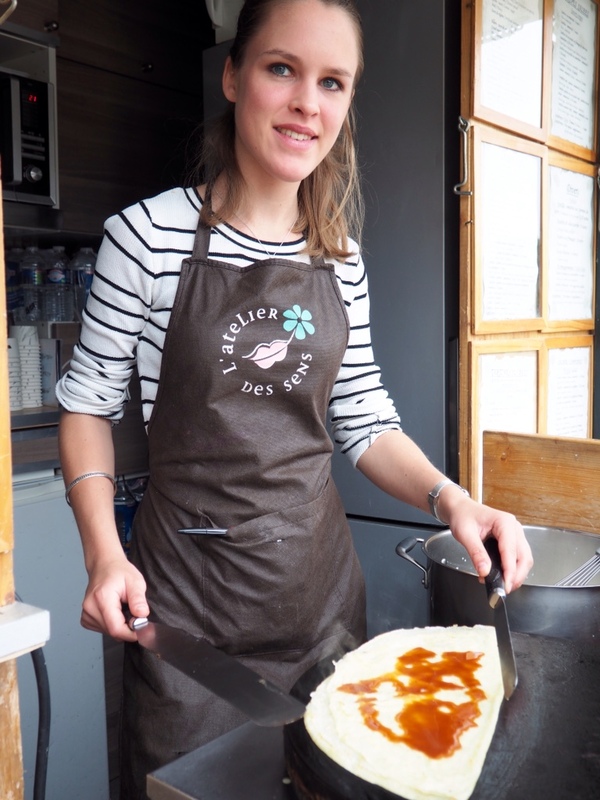 A caramel crepe, a chair and the Luxembourg Garden made a perfect treat. Paris remains in a state of emergency since the terrorist attacks and heavily armed military and police officers are everywhere. Patrolling vehicles are visible from almost every corner. 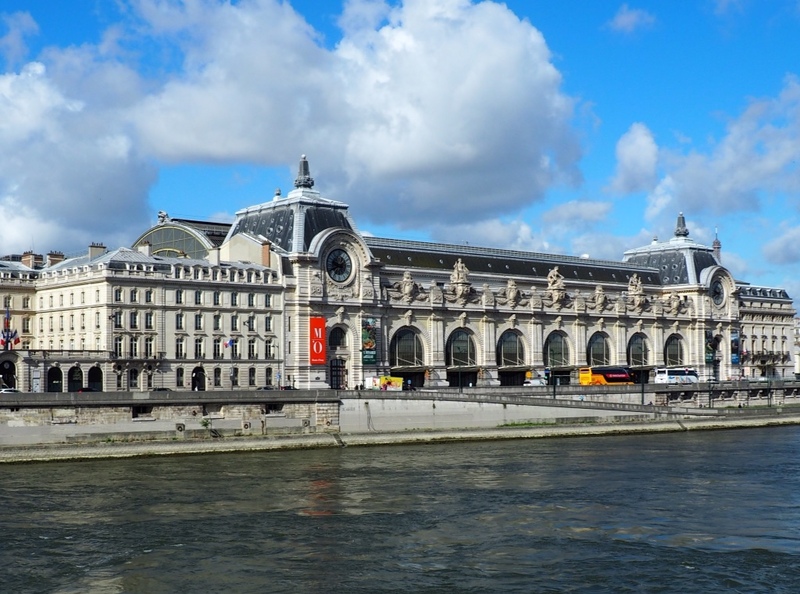 The Musée d'Orsay is located on the left bank of the Seine. The building was once a railway station. Today was the last day for our museum pass so we were up and out early. Eager to see what our guide book called “The best general collection of Impressionism anywhere,” we headed across the river to The Musée d'Orsay. This labyrinth of interconnecting galleries houses an amazing array of artwork – a few pieces familiar from long ago art classes. Later, after a short coffee break at a nearby sidewalk cafe, we crossed back over the river to the Musée de l'Orangerie, home to Monet's Water Lilies collection. We had no idea what we were walking into. Altogether, there are eight mammoth studies of the pond at Monet's home in Giverny. The museum created two specially designed oval rooms, each with four paintings, to best display the artwork. The effect is jaw-dropping. 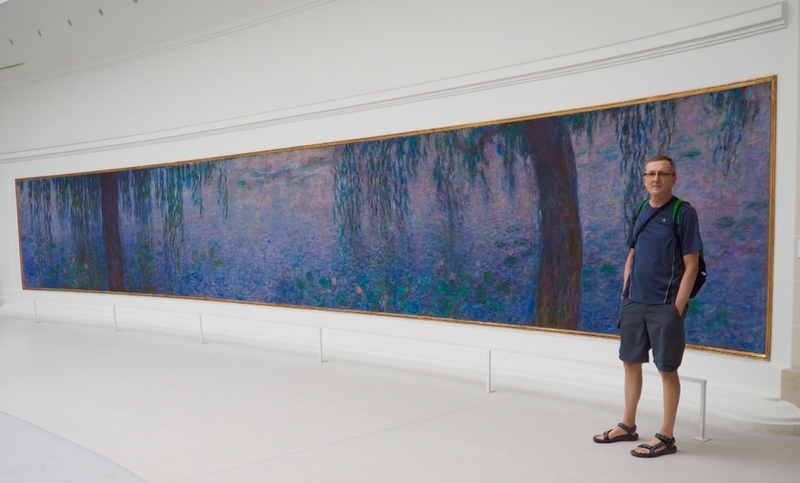 Monet worked obsessively on these paintings for 12 years. Sadly, he did not live to see them installed in the museum, but fortunately for us, his work lives on. 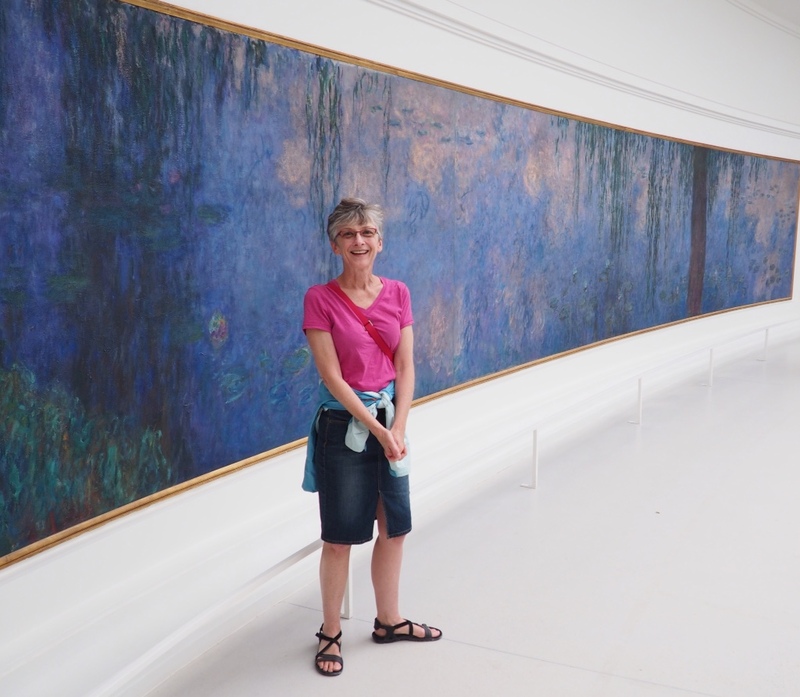 We were unprepared for the scale of Monet's Water Lilies. This was the favorite of Reg. 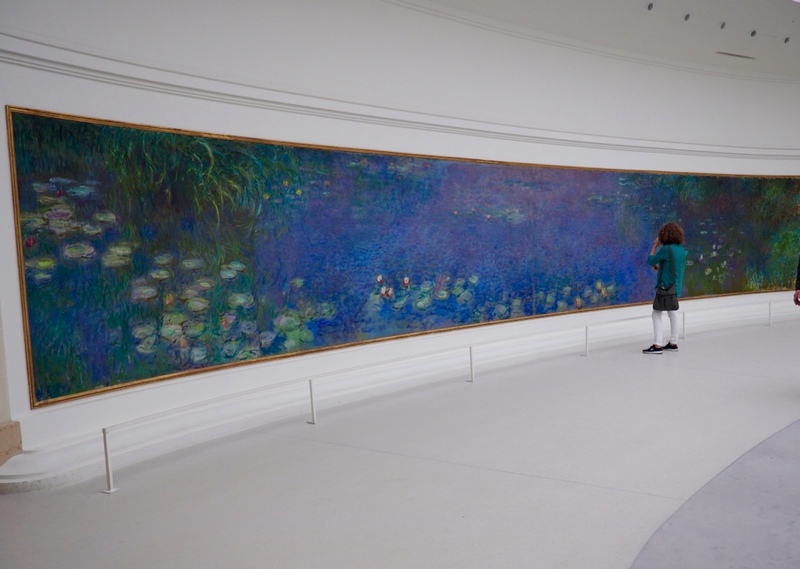 There were two separate oval galleries, each displaying four of Monet's Water Lilies.